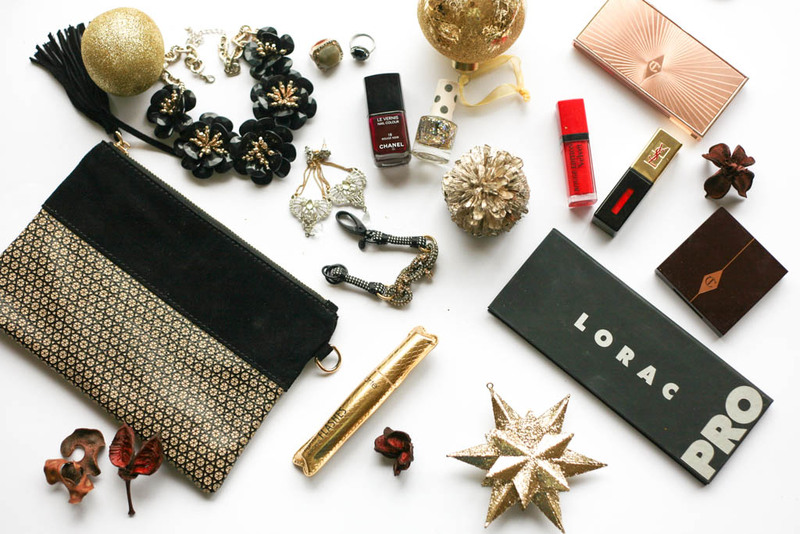 There’s nothing like the festive season, it’s the best time of the year to go all out…..right? 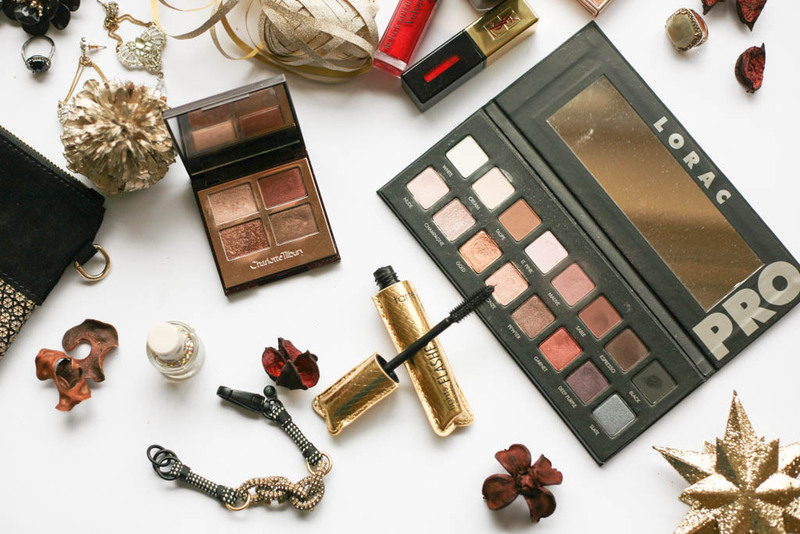 From sparkly jewels and glittery nails to glamorous makeup, I just love it and I always find that whatever your plans for the holiday season there is always a way of adding that extra sparkle and glamour in your step so I thought I’d do a round-up of some essentials to help get you into the festive mood. 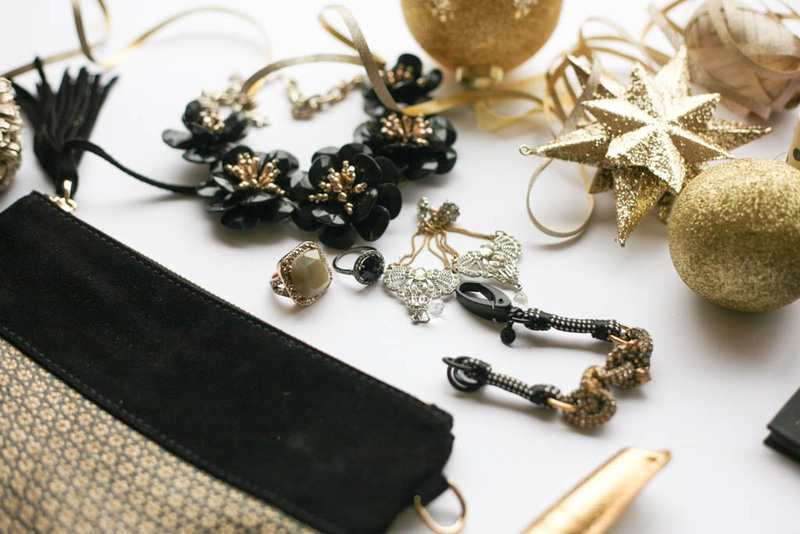 Firstly, and the most important is to get out the jewels as they instantly glam up any outfit. Whether it’s a statement necklace, a cocktail ring or some chandelier drop earrings, this is the time to get out your most favourite bling. I love these rings and earrings from Accessorize, my J Crew bracelet and an old Oasis statement necklace but go for whatever takes your fancy and remember to keep it chic by not necessarily wearing them all at once! If you’ve got loads of parties and nights out planned then an evening clutch is a must and I always like something with some feminine detailing but whilst dainty is great, it still needs to be large enough to carry my essentials. The one I have featured here is from Oliver Bonas which I’ve had for ages but Accessorize also stock such pretty evening clutches, so do check these out. A dark nail topped with glitter always adds that bit of somethin somethin on the nails and is a great way to introduce some sparkle. 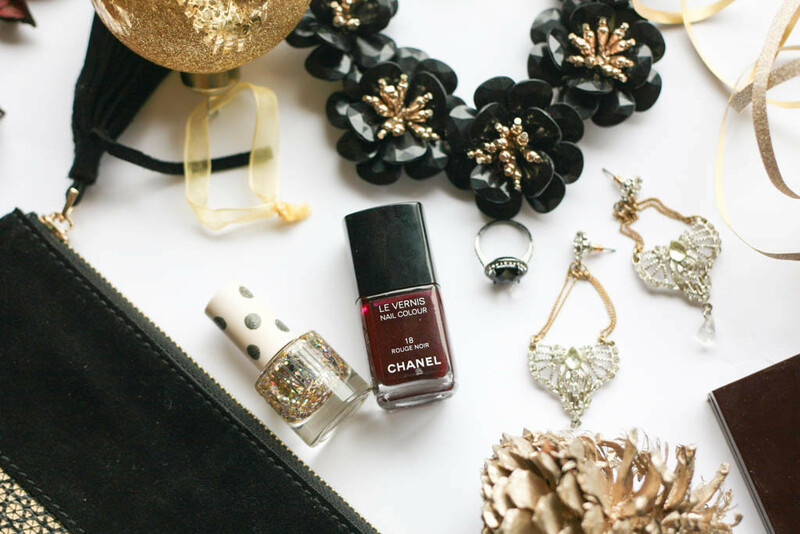 For the base something like Chanel’s Rouge Noir pictured above is a cult classic and Topshop as well as Essie and OPI do some gorgeous glitter polishes and top coats. I love this Topshop one as it’s a gold glitter with different sized particles. Shimmering sparkly eyes are essential. Whatever your budget there are an array of options available to you such as the Maybelline Eyestudio 24hr Colour Tatoo Cream Gel in Eternal Gold or the Max Factor Excess Shimmer Eyeshadow in Bronze, or if you really want to go all out then the Charlotte Tilbury Dolce Vita Eyeshadow Quad as pictured below is always a favourite (see my previous post on this here). Alternatively, you can go for a multi-use palette like the Lorac Pro Palette where the colour options and eye looks are endless with my favourites from this palette being Gold, Champagne, Bronze, Pewter and Taupe. Likewise full on thick lashes really add that finishing touch and false lashes are great for this or you can go for a mascara that does it all. I am currently loving Tarte’s Lights Camera Flashes Mascara but for some equally great drugstore options see my favourites here. Adding definition to your complexion and a lit from within glow with a touch of contouring and highlighting never goes amiss this time of the year. 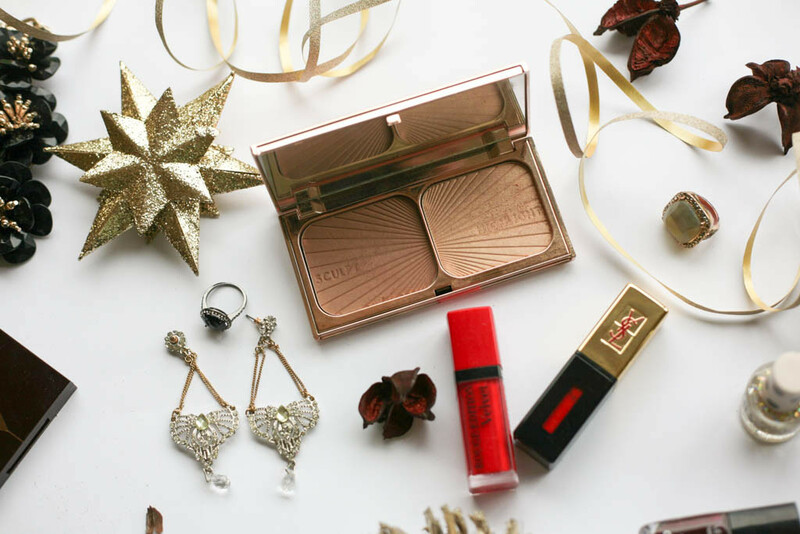 The Charlotte Tilbury Filmstar Bronze and Glow is a luxurious palette I like to take out for special occasions and see my post here for some of my other favourite highlighters. Lastly, I think a bold lip really speaks volumes. Whether you go for a matte, sheer or gloss, red or berry shades, there’s nothing like a pop of colour on the lips to help you stand out. I’m more of a red lip gal and the Bourjois Rouge Edition Velvet Lipstick in Hot Pepper and the YSL Rouge Couture Glossy Stain Lip in Red Flash are firm favourites.